September 2018 marked Google Chrome’s ten year anniversary since its first public release on 02/Sep/2008. The Google Chrome released version 69.03497 updating it from Google Chrome version 68.0.3440 in September 2018 to mark the tenth anniversary of its first public release. 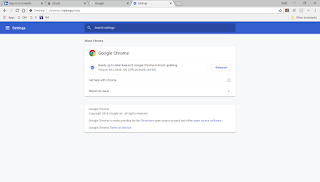 Google Chrome version 69.03497 introduced a fresh new interface of the browser, a major facelift which is a welcome change in the user community. Users who didn’t anticipate an interface makeover and want to document the Google Chrome browser screenshots before and after version 69.03497 upgrade can do so using following images. New toggleAttribute() method on elements toggles the existence of an attribute, similar to classList.toggle(). The Web Locks API allow users to asynchronously acquire a lock, hold it while work is performed, then release it.